Louie Villegas passed away peacefully at his home on September 4th at the age of 94. 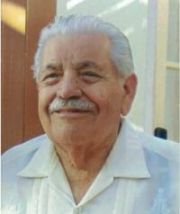 He was born June 21, 1921, in Santa Barbara on E. Ortega St. to Romualdo and Patrocinio Villegas. Louie, the oldest of five children, grew up in Santa Barbara and Lompoc where he graduated from Lompoc High School. In 1938 the family briefly returned to Santa Barbara but later moved to Chihuahua, Mexico, the hometown of Romualdo and Patrocinio. After World War II broke out, both Louie and his brother Mike returned to the U.S. in 1942 to fight in the war. Louie enlisted in the Navy, first serving as a gunner on the USS Gillespie. One of his first assignments was protecting a convoy of 100 ships that was heading to Africa to support General George Patton’s forces. On a later mission to Alaska, after delivering 900,000 gallons of gasoline, his ship was torpedoed by a Japanese submarine and Louie was wounded and thrown overboard. He was rescued from the freezing water by a Russian fishing boat that happened to be in the area. Had he not been immediately rescued, he would have died within minutes. After he recovered from his wounds, Louie continued to serve in the war in the South Pacific campaign. He was discharged in 1945. Louie returned to Chihuahua to propose marriage to Elvira Vega whom he had met before leaving to serve in the war. They married in 1946 and moved to Santa Barbara where they have lived ever since. Louie began working at Smardan & Hatcher Plumbing Supply as a truck driver and warehouse worker. His outgoing personality, organizational skills and bilingualism allowed him to eventually become the warehouse foreman. He retired from Smardan & Hatcher after a thirty year career. Louie was a very friendly, social person. He was proud of his children and greatly enjoyed family get togethers for special holidays, birthdays or barbeques along with annual family vacations to Mexico and other destinations. He especially loved his grandchildren and great grandchildren who were a constant source of joy. He had many friends and he highly valued those friendships. During his retirement years, Louie could be found at McDonalds every morning discussing sports and the world’s problems with an ever changing group of fellow retirees. Louie is preceded in death by his brothers Mike and Frank Villegas. He is survived by his wife of sixty-nine years, Elvira Villegas, his sisters Juventina Aranda and Rachel De Alba, his daughter Luz “Lucy” Villegas Buckelew (Pablo), son Luis A. Villegas (Tina) , six grandchildren (Rebecca Borgioli (Andrea), Paloma Arnold (Matthew) Bianca Vega (Joey), Ariana Alvarez (Alfredo), Maritza Best (Sean), and Alessandra Villegas (Carlos), ten great grandchildren, numerous cousins, nephews and nieces. Louie, the patriarch of the family, will be greatly missed. The family wants to thank Dr. Michael Bernstein for his 15 years of thoughtful caring for Louie and Visiting Nurse Association & Hospice Care’s terrific services, especially those of Elizabeth Swede. The Rosary will be held on Thursday, September 17, at 7:30 p.m. and the funeral Mass on Friday, September 18, at 10:00 a.m., both at St. Raphael’s Church, 5444 Hollister Ave., Goleta, CA.